2014 Luau Extravaganza « Shine On! Kids - Supporting children with cancer and other serious illnesses in Japan and their families. Shine On! Kids went tropical with this year’s Luau Extravaganza! Hosted at the Tokyo American Club, Shine On! Kids’ ninth annual extravaganza was a phenomenal success. 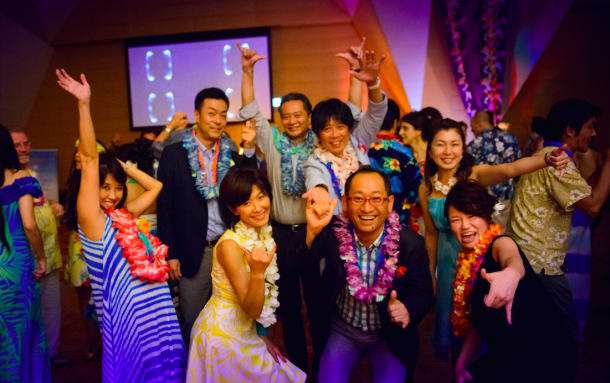 Over 200 guests, collectively raised more 26 million JPY. Thanks to United Airlines and Cathay Pacific Airways, we gave away tickets to Guam and the Maldives! Congratulations lucky winners! Speakers included Shine On! Kids’ President, Kim Forsythe and patients and families of the the Beads of Courage® and Facility Dog programs. In addition to games and plenty of dancing, the gala’s entertainment included an opening song from Donna Burke, Natalie Ferris and Aimee Blackschleger, performances by Hulabootie/Pa’i Kukui, and songs by the Tokyo International Children’s Choir. To see the amazing menu of food and wine brought to you by The Tokyo American Club and Pieroth, click here. Congratulations to the Grand Raffle winner, they are going to the Maldives! One lucky raffle winner and their friend will be flying business class to the Maldives and staying 3 nights in luxury thanks to Cathay Pacific Airways and the Four Seasons Resorts Maldives! To see all of those prizes, click here. Thank you to Marsha Grey of Hulabootie for sharing hula and the spirit of Hawaii with Shine On! Kids. The mission of Hulabootie is to share hula, language, and Hawaiian culture with keiki and their families and to support keiki’s growth and expression through dance. Hulabootie Keiki Program is dedicated to the education and development of children and the perpetuation of hula and Hawaiian studies. The program focuses on child development using movement, music, literature and story telling as educational tools. The Tokyo International Children’s Choir (TICC) was formed in 2012 by members of St. Paul International Lutheran Church to create an accessible high-quality musical learning and performing opportunity for elementary and middle school children in the greater Tokyo/Yokohama community. The TICC is open to all children between the ages of 6 and 13 on an audition basis. English is the language used for instruction, but our music knows no linguistic boundaries; French, Latin, and German, among other languages, are heard emanating from our rehearsal room. Ku’ulei Mamo was born and raised in Honolulu, Hawaii. Ku’ulei Mamo is an experienced and versatile ‘ukulele performer/teacher and drummer/percussionist with over 10 years of experience in teaching English and ‘ukulele in Japan. She received a Music Education degree from a university in Chicago, Illinois and is a member of the American Federation of Musicians’ Union. See more photos of the night on Facebook! Post by Shine On! Kids.